There are quilts and there are quilts. Quilted memories captured in bits of familiar clothes. Or stunningly patterned pieces joined with care and love. Whatever the quilt, its basic function is to keep you warm and cozy so that you get an uninterrupted night’s sleep. A restful sleep that leaves you fresh to seize yet another day. The Indian quilt , more often than not is a simple, basic quilt. It’s sole purpose is to just cover you up . 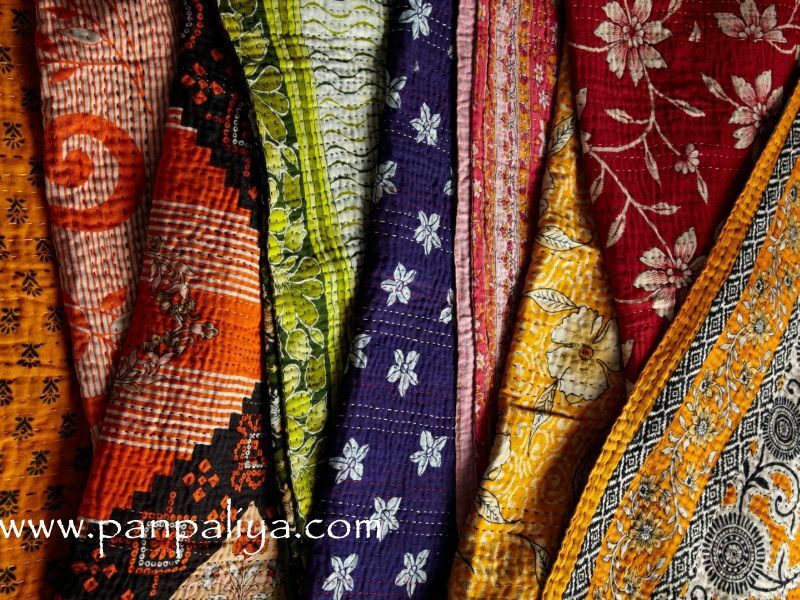 Layers of cloth ( generally old saris) are laid flat and then quilted into place with a rough thread in running stitch. These ‘godhadi’ ( as I know them) are an essential part of a baby’s traditional layette. And later on, the quilt gets bigger to keep you covered as you sleep. Since these quilts aren’t made of a stuffing or filling, they can be washed every other day! There is no fear of them not drying nor would it get bunched up and lumpy. How to make a Simple Indian Granny quilt. I remember seeing my granny assemble a quilt. Remember she used to wear a 9 yard sari so she had 3 more yards to play around with. Any ways, she would fold the sari adjusting the number of folds to get the required length of the quilt. The breadth remained constant. Since 9 yard saris are wider than the 6 yard ones, it also meant that the quilt was larger than the one you could make with a 6 yard sari. Well, after adjusting the size of the quilt, she would then add more saris to make the quilt thicker. Once she was satisfied with the thickness, she would take a fat long needle with a thick thread and hold the layers together with a running stitch. Following the shape of the cloth in straight parallel lines, she would stitch and stitch till the entire piece was quilted. And that was it. Without making complicated patterns with the running stitch. Funnily enough, this simple quilt, despite many washes would still hold her warm, granny smell. So that when we cuddled up in our beds, we could feel her presence comforting us. In the Northern parts of India where the Winter still chills to the bone, the quilts are much heavier and elaborate. ‘Razai’s’ or ‘Dulai’s’ are fat, bulky and terribly warm. They are stuffed with cotton and covered with velvet covers. On top of the quilt ( at least in our home) we had another thin muslin cover that could be washed. I love these Jaipur quilts that I dunk into the washing machine after the Winter months are over. Then I leave them out to dry in the sun, soaking up the warmth to keep us comfortable when the cold winds blow again. Thanks for visiting and do stop by to see what R has in store for you tomorrow! Join me and hundreds of other bloggers participating in the #AtoZ Challenge 2017. You can also find me at #UltimateBlogChallenge #blogboost and @Blogchatter. Awww I was looking forward to a saree style !!! 😉 I am so hooked to your blog Sunita- got tonnes of saree types to add to my collection. I never knew you could make a quilt like this!!! Interesting!!! Well it’s (qu) impossible to find a sari with Q and unless I wrote about something Quixotic there was no way I could fit it in my theme . I also thought the posts were getting too sari-centric and there wasn’t much traffic with this hook. ? I have stored tons of clothes of Bluey from his first yrear. I want to make a memory quilt with them 0 just don’t know when i can sit down and do something worthwhile with those though!